Greek 10-year yields are at the lowest level in more than 13 years — back to where they were long before the GFC, let alone the euro zone debt crisis — and they likely have further to fall. This reflects the extraordinary rally in global bonds, in a world awash with cash and yet lacking sustained inflation pressures. But it’s also a testament to the resilience of the euro project. Not only has Greece stayed within the bloc, but there are signs its economy is slowly normalizing/adjusting. The process has been incredibly painful, remains ongoing and is not guaranteed to succeed long term, but it suggests that structural reforms can potentially be implemented over time. The latest leg of the bond rally has been fueled by EU finance ministers agreeing to disburse 1b EUR in funds to Greece, saying the country has fulfilled the reform conditions set out in its first post-bailout review. That may enable the country to refinance at lower cost, further improving its debt profile. 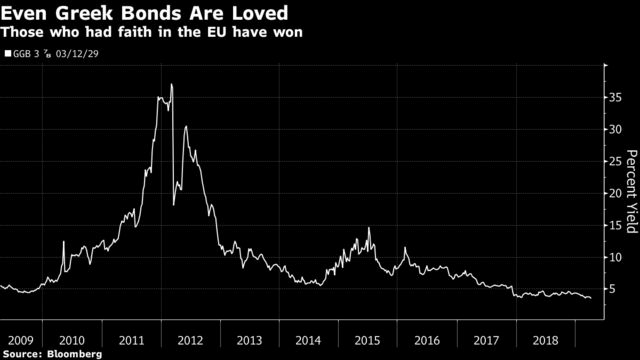 It’s not just Greek bonds that are in favor — the country’s equities will continue to outperform as the economy recovers and benefits from debt relief. The Athens Stock Exchange has soared about 23% this year, outperforming the Stoxx 600 and even surpassing peripheral peer Italy. Part of the gains are due to the global risk rally as well as Greece’s economic recovery, with GDP forecast to grow 1.9% this year, versus 0.1% for Italy and 1.2% for the euro zone. Financials make up almost one-quarter of the ASE and comprise some of the best year-to-date performers. The FTSE/Athex Banks index has soared over 40% ytd. The euro-area’s agreement to disburse around EU1 billion to Greece can support both the bond market and the country’s banks. Greece may also repay part of its IMF loans early.